Up & Away Aviation detailing Ltd are delighted to announce that we are the official aircraft detailing company for the Farnborough INTERNATIONAL AIR SHOW 2016. 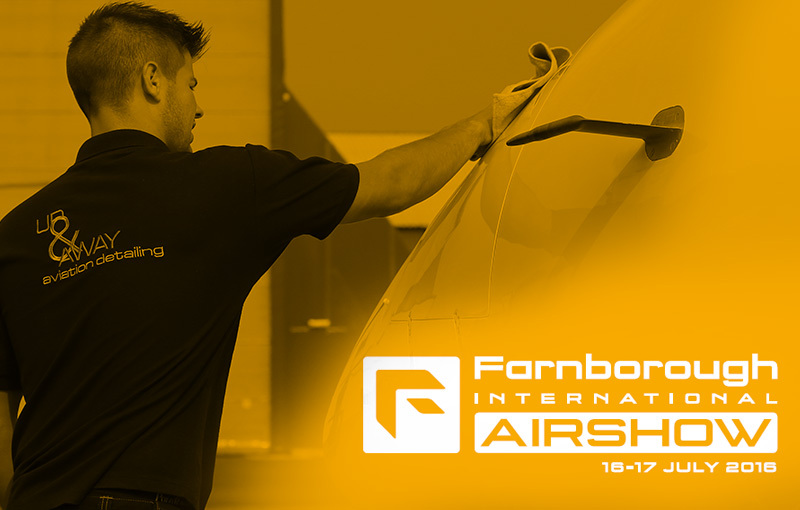 We are offering Aircraft cleaning and detailing services throughout the duration and lead up to the show, we will also be on hand to offer visits throughout the day for the static aircraft on the stands pre, post or during the show for touch up cleaning. We will be offering a full menu of services so please check out our website for more info on the services up & away aviation provide. All of our detailers are fully trained to a high standard and we are able to offer these services to all types of aircraft from vintage, GA, Business jets, Military and commercial sized aircrafts. We are able to offer full support packages throughout the airshow to suit your budgets and required needs. Please contact the team on +44(0)1252 526868 or email us operations@upandawayaviation.co.uk for more information and bookings. We look forward to seeing you all here for the 2016 airshow and supporting your required needs. Best Regards from all the Up & Away team.